Removing mold from boots may require several cleaning techniques for success. 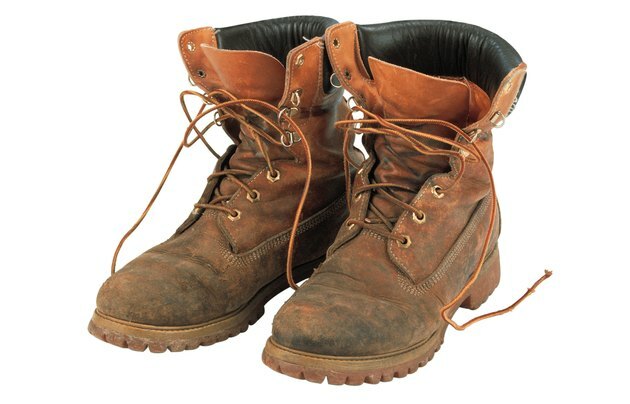 Boots left in humid or damp conditions are prone to acquiring mold and mildew. Leather and suede boots may begin to discolor and feel hard in texture. If left too long without cleaning, moldy boots may become ruined. To save your boots from mold, thorough cleaning of the inside and outside of the boots must be performed promptly. Boots are prone to mildew and other types of mold. Brush any visible mold off the boots with a bristle brush while wearing work gloves. Perform the cleaning outdoors to prevent the mold spores from scattering inside your home. Mix a solution of equal parts warm water and rubbing alcohol. Dip the tip of a clean cloth into the solution. Rub the solution in small circular motions on the areas in which mold is growing. Pour a tbsp. of saddle soap into a small bowl or bucket. Add one cup warm water and mix to create a soapy solution. Wash the boots with the saddle soap and water solution and rinse clean. Clean white boots with fresh lemon juice. Coat the boots with a layer of salt and allow it to dry in the sun. Rinse the boots well when dried. Clean colored boots with a solution of 1 tbsp. sodium perborate bleach and 2 cups warm water. Soak the boots in the solution for 30 minutes and rinse. Spray the inside of the boots with an odor eliminator spray. Continue to spray the inside of the boots on a regular basis to get rid of the mold smell and to discourage further mold growth. Erase hard to remove mold and mildew stains with a gum eraser. Rub the stains using small strokes of the eraser. Wash the spot thoroughly with soap and water when finished to remove any excess residue. Leave the boots in a warm, sunny environment. Keep the boots dry and free of moisture to prevent the mold from returning. Polish the boots on a continued basis to protect them from scratches and color variations.